Concerts and Events | Jamie-Leigh T.O. The music portion of NXNE music festival kicks off next Wednesday with shows across the city. This will be my 5th year attending the festival and I’ve finally smartened up and booked Thursday and Friday off work so that I can see as many shows as possible and not suffer through my usual 6am wakeup the next morning. Also very exciting is that in 10 short days my BFF/old roommate/former coworker/heterosexual-lifemate Elissa will be in town for a few days! We got hooked up with Priority Passes from the good folks at NXNE so we’ll be venue-hopping and band-groping from Thursday to Sunday together. You can follow what we’re up to on my Twitter and I’ll recap here when I have time. One of my fave parts about NXNE last year was the huge (unofficial) role social media played throughout the festival. While NXNE’s twitter account was very helpful last year, so was following the festival’s hashtags and people on my timeline to figure out what was going on at the venues they were at. You can find out who surprise performers are in time to get to the venue, or decide whether or not it’s worth leaving the venue you are currently at to head to another one. People were constantly updating about the length of lines at venues, whether shows were running on time (which is great if you’re debating waiting to see another band at the venue you are at before dashing out to the next one) or if shows were at capacity. I’m looking forward to see how NXNE embraces social media this year and hoping to use it to help me efficiently navigate (or drunkenly stumble) my way through this year’s festival. Seriously, tell me because I need your suggestions. Leave in the comments because my telepathy has been experiencing connection problems lately. Exceeded bandwidth or something. I’ve also entered to win exclusive passes for me and 9 friends to the Exclaim! 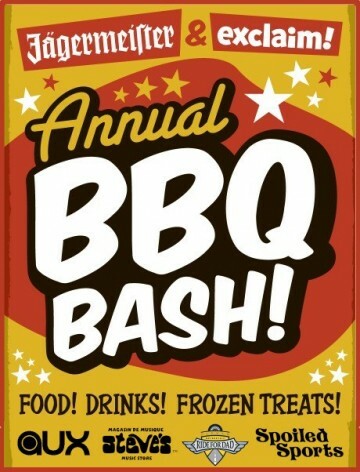 and Jägermeister Annual BBQ bash at the Cadillac Lounge on June 17th. Crossing my fingers and toes I win because that would be an awesome party to attend! I would post pictures of nachos and jager sno-cones all night to make you super jealous. Just kidding, I’d totally bring you with and we could dance to some Monster Truck and Young Rival together!